Is a Favorite Delicacy Threatened with Remaining a Prisoner of the Past? Viipuri soft pretzels [viipurinrinkeleitä] have been made in small home bakeries in the Lappeenranta region for centuries. Back in the day, they were taken to the Viipuri (Vyborg) market to be sold, among other places. The pretzels are still produced, but the customer base is thinning and the number of bakeries dwindling. It is up and early in the Lappeenranta village of Hanhijärvi on Monday morning. At half past two, Risto Helkala arrives in the back room of a single-family house that doubles as a bakery. Helkala first pours sugar into the bottom of a large dough mixing bowl. Then a couple of buckets of water, cardamom, and other spices. The yeast is the size of a brick. There is a tubful of butter. 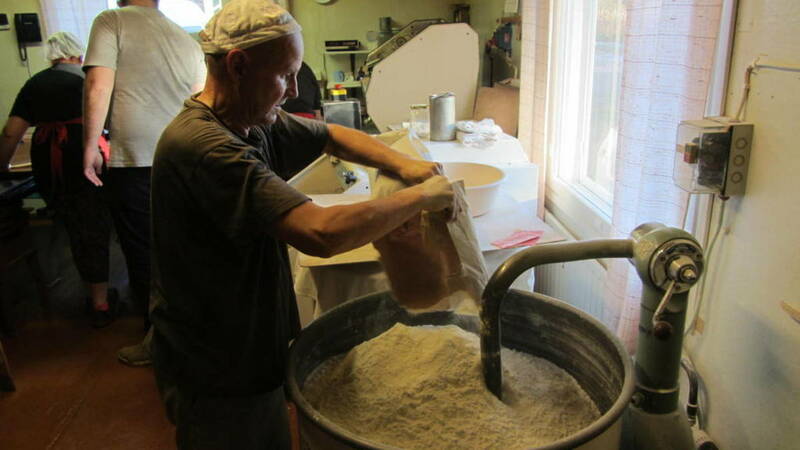 “I don’t know many liters of dough will come out, but 60 kilos of flour go in,” says Helkala. A big mixer begins mixing the dough in the metallic dough bowl. Juho Pulli Bakery is in an ordinary looking single-family house in Hanhijärvi, in the Lappeenranta countryside. 86-year-old Ritva Helkala lives in the house. As a little girl, she would go to the markets with her father, Juho Pulli. In the 1930s, the trips from ranged from Lappeenranta to as far away as Joensuu, Hiitola, Lahdenpoja, Värtsilä, and Suistamo. They traveled by horse or train. “A ledger book from 1880 has been preserved which shows that 19 trays of pretzels were produced. 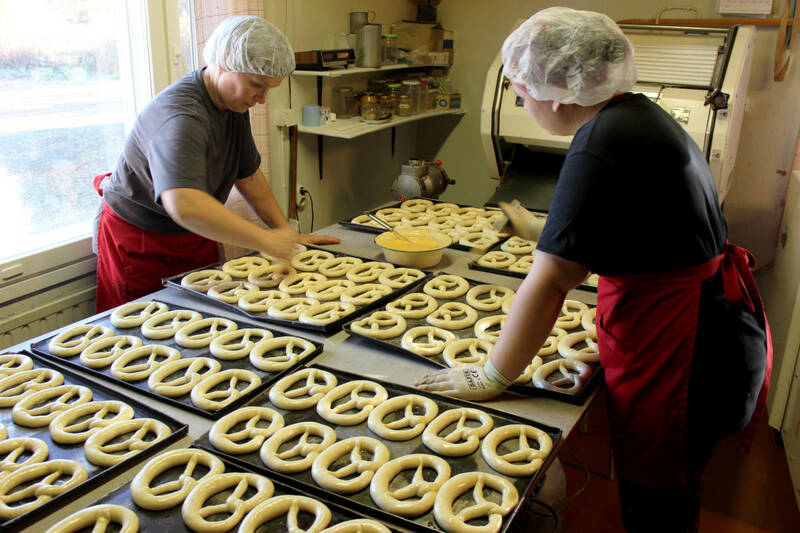 Pretzels have been made here for a long time,” says Ritva Helkala. 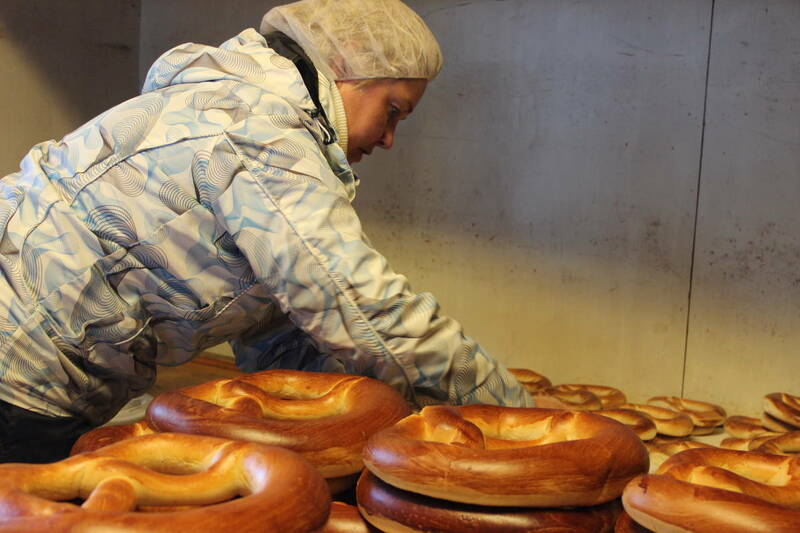 Nowadays, there are a dozen pretzel bakeries in Lappeenranta and the neighboring municipality of Lemi. Each bakery’s pretzels taste different, and the recipes are secret. “I make grandfather’s recipe, and he said he was making his grandmother’s recipe,” says Risto Helkala at the bakery. The dough has been rising for just over an hour. It is time for the dough to be kneaded. According to new laws, the dough’s ingredients must be listed, but how much of what is used is a carefully guarded secret. “A Viipuri pretzel baker would not reveal the recipe even on his death bed,” says Ritva Helkala. Although the Viipuri pretzel has been made for centuries, the war years of 1939-1945 and their aftermath led to a serious disruption in production. Then, when the war ended, pretzels were a bit peculiar. Not all the ingredients could be obtained. “They were made with the spices that could be spared. Then, after the wars, cardamom became available. When restrictions on the sale of sugar were removed, production took off again,” recalls Ritva Helkala. Her son Risto has rolled out the dough. He is making a stick a meter long and thick as an arm. “It’s like a snake. It’s called an anaconda,” Risto says with a laugh. There are five women in the bakery besides Risto. “Get ready. The pretzel-making is beginning,” Risto exclaims. In an adjoining room, Risto’s mother Ritva sits in an armchair. She still drops by to check the pretzels from time to time. Helkala’s memory is sharp as steel, and her voice is firm. After this, the surface of the dough would be rubbed with butter. Then the stick would be put in a pile, and they would began again to knead the dough into a long bar. “I remember when my arms would be swollen below here,” recalls Ritva. Doughs were tougher in the 1930s and 1940s than now. According to Ritva Helkala, the pretzels had to withstand long journeys. They stood quite upright in the basket. At the Juho Pulli Bakery, everything is ready for making pretzels. Risto Helkala is cutting the dough stick into small pieces about a hundred grams in size. “We’re making small pretzels now. There are also large and medium-sized pretzels. The biggest ones are the most popular,” Risto explains. Two bakers grab the familiar pieces. Hanna-Riikka Nykänen snatches a bun-sized piece of dough and kneads it into a long, thin rod. Nykänen takes the rod at both ends and, in three seconds, spins it into something that looks like a pretzel. She already has a new piece of dough in her hand. There are currently a dozen Viipuri pretzel bakeries in the Lappeenranta region. The bakeries usually operate out of single-famiy houses. Pretzel production is rarely their main livelihood. The Helkala family also owns an electrical installation company. Twenty years ago, there were twice as many Viipuri pretzel bakeries in the Lappeenranta vicinity as there are now. “The customer base is thinning, and marketing is pretty nonexistent,” says Sanna Lento-Kemppi of Southern Finland Farm Women and Homemakers. Lento-Kemppi has been tracking rural entrepreneurship for years, particularly in the Lappeenranta region. Lento-Kemppi’s surmise is easily confirmed by a quick search on the Internet. None of the Viipuri pretzel bakeries have their own Internet or Facebook pages. A new generation that doesn’t go to markets has grown up in Finland. At the same time, Viipuri pretzel buyers have also become less numerous. In Lento-Kemppi’s view, Viipuri pretzels missed out on modernization in terms of both marketing and product development. In Lappeenranta, yet another Viipuri pretzel bakery closed last year, nor do all the existing bakeries necessarily have a successor on the horizon. 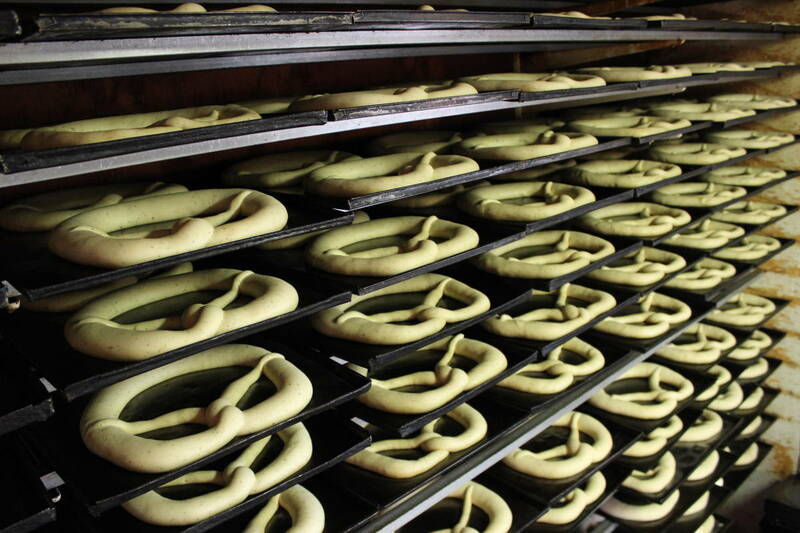 One reason for the decrease in pretzel-making is that manufacturing and selling pretzels requires persistence. One must be in good physical shape to do manual labor, and selling pretzels in the winter frost or sleet is not something everyone finds enticing. It is +36 degrees Celsius on the thermometer in the Juho Pulli Bakery. The large wood burning stove in the corner radiates heat. Arja Laukas lifts the large baking trays onto a perch. Kirsi Kostiainen, standing nearby, peeks into the oven. One more tray goes into the oven. A motor rotates the trays in the oven’s heat. When the door opens, the soft, glowing warmth pours over Kirsi’s face. In spite of the heat and bustle, the work in the bakery flows with army-like precision. “I’ve been doing this almost three years,” says Kirsi. Over the years, a light spot, a spot not darkened by the ovens, has been left on the old baking trays. The spot is pretzel-shaped. Traditionally, Viipuri soft pretzel recipes and the craft of making them have been handed down from one generation to the next. In the 1930s, there were several bakeries in the village of Hanhijärvi. Their employees could go into business themselves. “There were women at work in them who noticed that you could earn well this way,” Ritva Helkala laughs. Her daughter-in-law, her son Risto’s wife Sirpa Helkala knows all the steps of making pretzels. She and Risto went into business in the early 2000s when the bakery changed hands generationally. 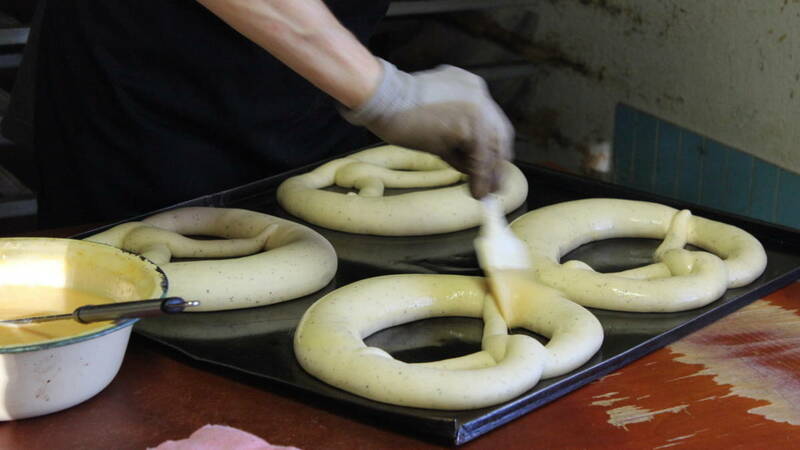 Sirpa takes care of pretzel-making, as well as the company’s accounting and payroll. “Viipuri pretzels have a good future. 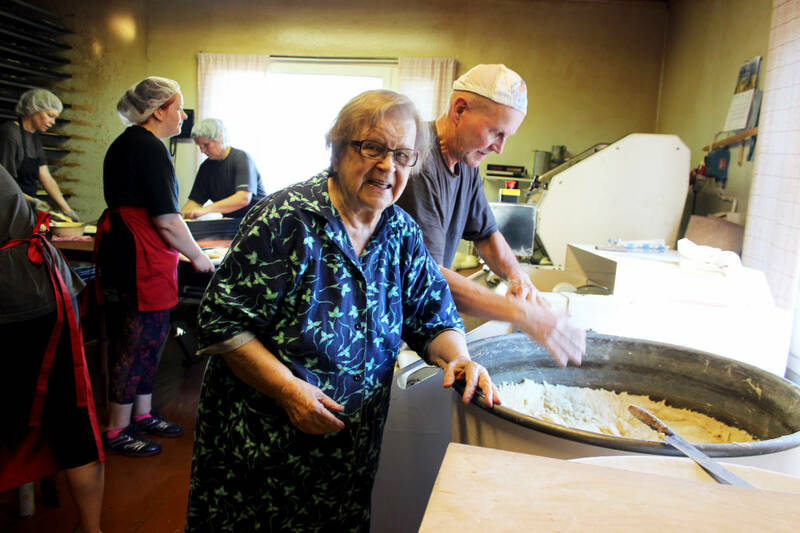 The business is doing well, and both young and old still like soft pretzels,” says Sirpa Helkala. The finished pretzels are packed into bags. These are going to the market in Kuopio. In the living room, Ritva Helkala rises from her chair and walks to the bakery side of the house. Everything seems to be alright. The new generation has taken over pretzel-making nicely.